On-site, the campsite pony-riding centre invites your children to mount up and enjoy a pony ride from the age of 2 years. Rides and lessons are available for the youngest. 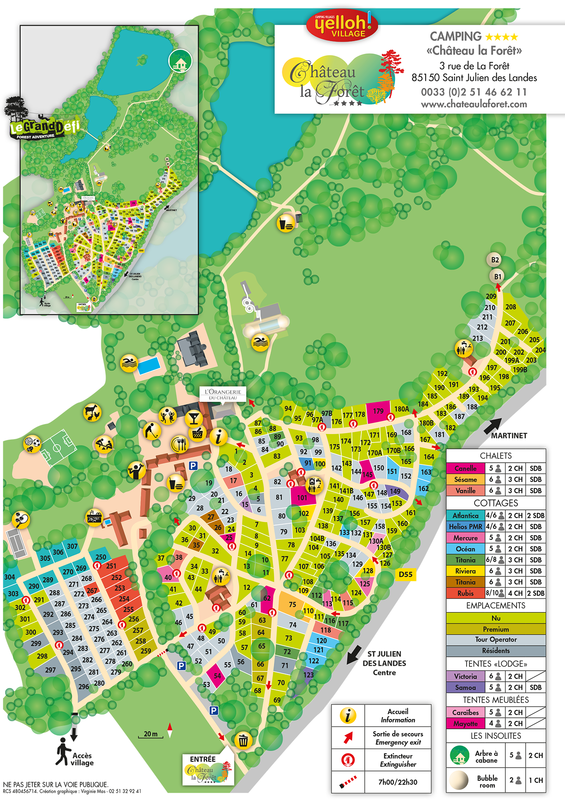 The camping Yelloh Village Château la Forêt is a veritable paradise for kids where both youngsters and their parents can appreciate having close contact with the ponies. So don’t hesitate to ask at campsite reception to find out more about the conditions, prices and the running of the riding centre. Don’t forget that the activities and entertainment are available from the start of the campsite season. Campsite with paintball and tree-top adventure trail on-site! Exceptional! Discover the adventure park with tree-climbing trails and paintball, right here in the park at the camping Château la Forêt in the Vendée! The tree-top adventure trails invite all ages to come and have fun on the zip-wires and monkey bridges, the mad scientist’s bicycle and the many other structures set high in the trees. Try one or more of the 14 trails for some great family entertainment. Trails for the “tiddlers”, “little wolves” and “intrepids”, all specially designed for the youngest (2 to 5 years). Older children will be able to experience the excitement of other trails such as the “discovery” and “explorers” (from 6 years upwards). The “family”, “mad scientist” and “jungle” trails are accessible from the age of 9 years upwards and the “adventure” trail from 12 years. From 15 years up, all the challenges in the vast park are within your reach, including the black trail. So the whole family can take to the trees in total safety, under professional supervision. But that’s not all! 4 paintball fields await you for a colourful battle certain to delight all ages. And from the age of 6 years upwards, your little adventurers can also join in. They’ll be able to amuse themselves in total safety thanks to equipment specially adapted to their age. Adventure, thrills and excitement guaranteed at the Yelloh Village Château la Forêt in the Vendée! All through the season, a wide range of activities and entertainment is on offer. One thing is certain - you'll never have time to get bored! Here at Yelloh Village Château la Forêt, come and experience an amazing family stay. From start to finish, it’ll be fun and laughter every day! Yelloh Village Château la Forêt, the perfect holiday destination for golfers! Ideally situated, less than 40km from 5 international golf courses, make the campsite your base for a relaxing break after each round. Well-designed and the closest to the campsite. Right next to Les Sables d’Olonne. The most difficult, with narrow fairways. A seaside links course, with breathtaking views over the ocean. In the heart of a holiday village, with sea views. Don’t hesitate to call into reception for further information. Depending on your level and the type of course you’re looking for, we’ll be able to provide all the help and advice you need.